Myron A. Waterman's ties with the religious Progressivism of his day are apparent in this pamphlet. Waterman's brother-in-law was Charles Sheldon, a well-known Congregationalist minister who wrote the book In His Steps, and who popularized the question, "What would Jesus do?" Sheldon was a proponent of the social gospel movement and believed that Christian philosophy could be used to address social problems. 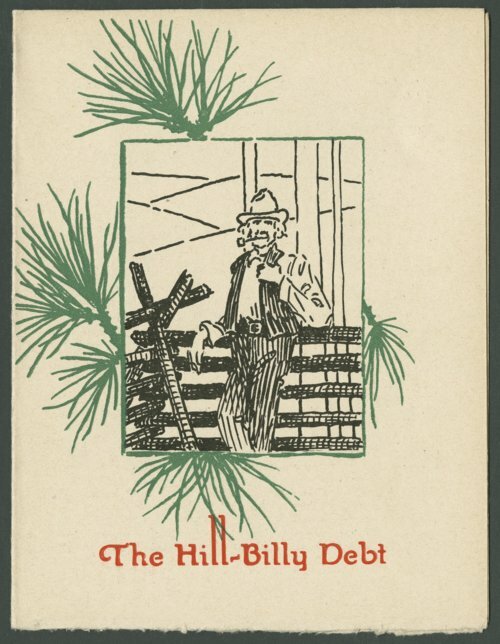 These ideas are reflected in The Hilly-Billy Debt; in it, Waterman tells the story of a rough, hard-drinking man who embraces Christianity after a simple hillbilly pulls his car out of the mud with a team of mules, and encourages him to help his fellow man in the same manner as a form of payment. A short poem by Waterman's wife, Alice Sheldon Waterman, appears on the back of the pamphlet.